Review of Molly’s Suds powdered laundry detergent, made in St. Petersburg, Florida. 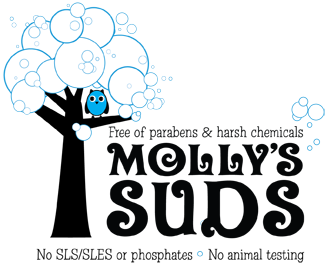 Molly’s Suds has been on my safe list for some time after Monica shared her great product info with me as I was forming my “safe/approved” list. She/many of you know I love soap nuts (EcoNuts specifically), but I wanted to round out my safe list with both a liquid (MamaSuds) & powdered detergent so there’s something for everyone. I’m very happy she sent along a 70-load sample along with the box of goodies you all ordered through the Sep. Buying Club order, so I’ve been using it for a couple of weeks now. I can say that it completely lives up to my expectations & the peppermint essential oil leaves a faint but pleasant fresh smell. Many using soap nuts have commented at the less than fresh smell left on their clothes, although many of us don’t want our clothes to smell like anything. That being said, I haven’t used conventional laundry products for a few years now & don’t expect my clothes to be sparkling clean. With any natural laundry detergent your best results will come if you don’t let stains set in to begin with. I didn’t put this to any red wine stain test or anything, just have been using it on our normal, everyday laundry and am completely satisfied with the results. The cloth diaper powder is a new product. The standard laundry powder can be used on cloth diapers but does contain the peppermint essential oil which can void some diaper warranties, which is one reason Monica developed a specific laundry powder just for cloth diapers. I stuck with using my soap nuts for my cloth diapers, as I was a bit weary of using the peppermint oil. Laundry powder ingredients: Proprietary blend of sodium carbonate from the Green River Basin in Wyoming, sodium bicarbonate, epsom salt (epsomite) and sea salt. While there are no perfumes, which are neurotoxic and petroleum based, there is a very minimal amount of organic peppermint essential oil. Additional info from Monica: ”Another note for you about our Laundry Powder is that our sodium carbonate is NOT super washing soda… It’s mined from the Green River Basin and crushed, packaged and shipped to us. Most detergents in the industry use the solvay synthetic and processed from ash (hense soda ash) and it’s not natural. We use food grade, aluminum free sodium bicarbonate safe for use in organic formulations and food. We use only corn and gluten free sea salt without the use of separators, fillers and anti-caking agents, it’s more pure than table salt, crazy what they put in table salt. Our Epsom salt is pharmaceutical grade and pure. Also zero anti caking agents, free flowing additives or conditioners- found in most all Epsom salts. None of our ingredients are of animal origin. No melamine- also common in “homemade” packaged laundry powders. It’s very pure, and while I know it’s not soap nuts it’s a fabulous alternative and more pure and primal than homemade detergent people make that has so many hidden ingredients they aren’t aware of.” Ingredients are from USA and the molding for the bottles and scoops are all done in USA as well but she can’t guarantee that the raw material is from USA. I know many of you have tried this detergent, please share your feedback on it too!